See you at The Heart of the Ranch at Clearfork! 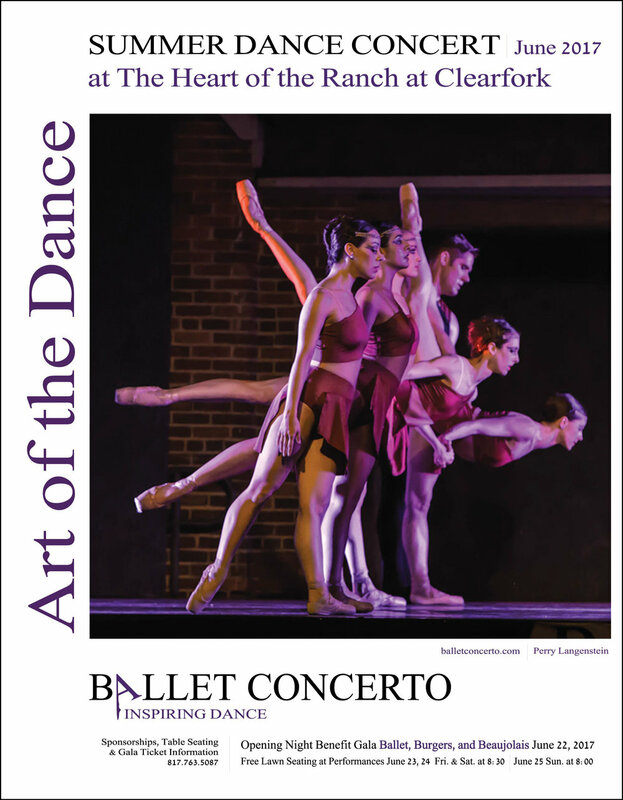 This page will provide recent news stories and all detailed information about Ballet Concerto's SUMMER DANCE CONCERT, a fully staged, professional mixed repertoire ballet production held in an outdoor venue in Fort Worth for four nights in late June. We are thrilled to be hosting this year's performance at The Heart of the Ranch at Clearfork, just down the Trinity River from the old location at the Trinity Park Pavilion. (Fort Worth Texas, September 1, 2017)...Margo Dean, founder and artistic director of Ballet Concerto Inc., a Fort Worth institution that has presented an annual free-to-the-public, fully-staged professional dance production each June since 1981, has announced that the company’s SUMMER DANCE CONCERT performances will move from Trinity Park to The Heart of the Ranch at Clearfork adjacent to the Trinity River and a part of the Clearfork Developments in near Southwest Fort Worth. Find additional information here. This year's Summer Dance Concert will be the Art of the Dance, a mixed repertoire program. Running time approximately 120 minutes. Addition information with date and time, location, opening night gala, tickets and contact information can be found here. The Summer Dance Workshop is a dance intensive held by Ballet Concerto from June 4-22, 2018, leading up to the SUMMER DANCE CONCERT. Classes are held at the Margo Dean School of Ballet, at 3803 Camp Bowie Blvd., in the Fort Worth Cultural District. Participants experience master classes by guest teachers on an ongoing basis during June. Please find more information here. There will be a gala opening night dinner party and performance at The Heart of the Ranch at Clearfork to raise funds for Ballet Concerto’s 2018 SUMMER DANCE CONCERT. Details TBA. This is an invitation-only event on Thursday evening, June 21, 2018. Interested guests may request an invitation and purchase tickets. Please find additional information here.